In Chinese food, a dumpling is a ball of dough filled with meat, fish or sweet fillings. Dumplings can be eaten alone or added to soups and stews as part of a main meal. Steamed dumplings are healthier than fried dumplings. A portion of pork-filled, steamed dumplings from P.F. Chang’s Restaurant contains 60 calories. Its steamed shrimp or vegetable-filled dumplings contain 45 calories per portion. Ordering pan-fried pork-filled dumplings from P.F. Chang’s will add 10 calories while the pan-fried shrimp or vegetable dumplings contain 60 calories per portion, thus adding 15 calories. 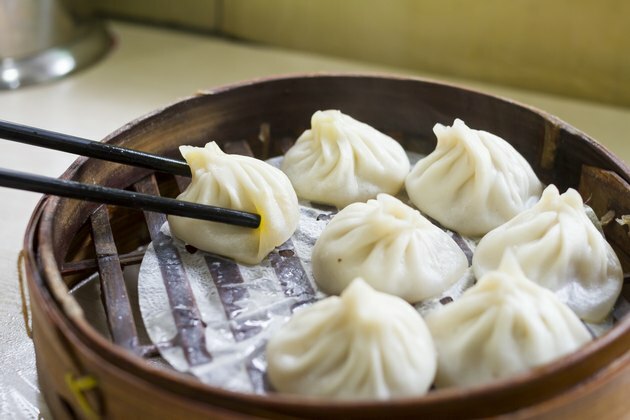 An average steamed dumpling filled with meat, poultry or seafood contains 41 calories and equates to 2 percent of the recommended calorie intake. One dumpling also provides 0.98 g of fat, 3.54 g of carbohydrate, 0.2 g of fiber and 4.27 g of protein.